by Hot Topic and Fan Factory! To enter, submit an original design inspired by your wicked favorites: Cruella De Vil, Ursula, The Evil Queen, Maleficent, Hades, and Dr. Facilier. 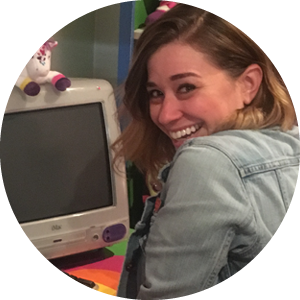 Mallory Leveille is the Divisional Merchandise Manager for licensed apparel at Hot Topic, where she lords over the poor souls of her unfortunate staff from a throne (aka her squeaky office chair). She’s been with the company for 13 years, taking out her predecessor with a juicy poison apple. When she's not at work, she collects dogs (but not to make coats from), enjoys hiking (mostly to get away from the idiot hyenas in the city) and loves to play card games (unfortunately, her cards don’t turn into an evil army). Her favorite villain is Lady Tremaine and she hopes to follow in her footsteps and have a child for free maid service... (she's not a monster- kids have to do chores!). 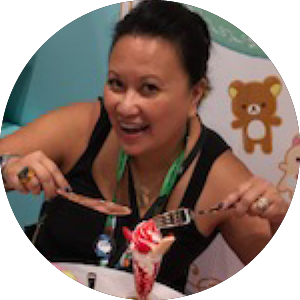 Theresa Mercado is VP of Product Development for Licensed Apparel and Fashion at Hot Topic, BoxLunch, and Her Universe. During the day her team produces elaborate garments spun out of gold on a beautiful old timey spindle – being very, very careful not to prick their fingers or it sets them back 200 years. For kicks and giggles, she loves to eat teddy bears with her sundaes. J/K, not enough protein. 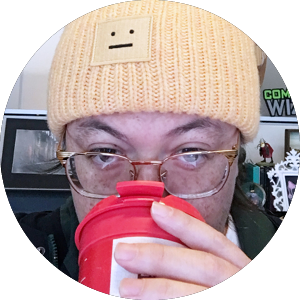 Theresa does live with a ferocious beast named Duke, who pretty much runs her life outside of work. Theresa's favorite villainesses are Maleficent and Ursula because they are so misunderstood, and "I mean, who doesn't love a good brow arch?" Javier Garcia is Sr. Manager Product Development, Adult Apparel & Beauty at Disney, where he has been for 5 years, happily spending his days working on Juniors and Young Men’s Fashion, as well as Adult Beauty. Aside from Disney and his family, Javier has a deep love for pizza, music and #menswear. You can catch him chasing hype, clout and the latest sneaker release daily. Explore the full story of the each individual villains- incorporate secondary characters and environments, but do not include the hero characters. Villains include Cruella, Ursula, Evil Queen, Maleficent, Hades, and Dr. Facilier. Disney Villains are powerful, driven characters who are sophisticated, yet flawed, and in some ways are relatable. This is your chance to let your Disney Villains fandom really come through. Your designs and illustrations can include current themes or favorite icons associated with the Disney Villains. Do not incorporate any other brands or product with Disney Villains; they cannot appear to be endorsing another brand or featured with another brandsDisney Villains cannot be depicted with other Disney franchises such as Disney•Pixar, Lucasfilm, or Marvel or any other Disney character. 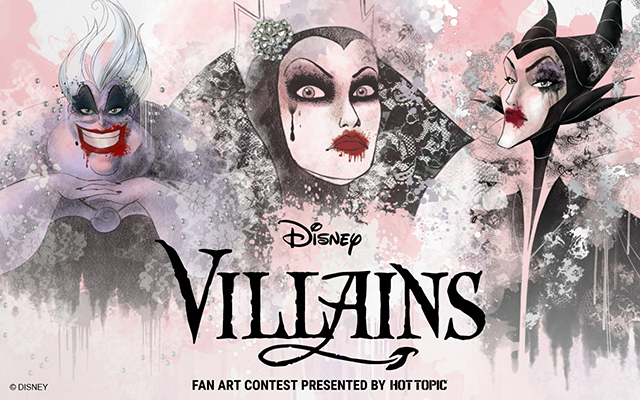 Disney Villains Fan Art Contest begins July 13, 2018 and ends July 31, 2018. Must be age of majority or older to enter who, at the time of entry, are legal residents of and are physically located in the United States, the District of Columbia or Puerto Rico. One (1) grand prize winner will win $2,000 and no fewer than four (3) finalists will each win $300. Ten entries per person during the Contest Period. Total ARV of all prizes is $2,900. Void where prohibited. See Official Rules for additional eligibility restrictions and complete details. Sponsored by Hot Topic, Inc. and BoxLunch 18305 E. San Jose Ave, City Of Industry, CA, 91748 United States ("Sponsor") and administered by Fan Factory, ("Administrator"). 1. CONTEST PERIOD: Submissions will be accepted starting July 13, 2018 at 12:00:00 am Pacific Time ("PT") and ending July 31, 2018 at 11:59:59 pm PT (the "Contest Submission Period"). The judging will take place beginning on: August 13, 2018 through August 17, 2018.
of Hot Topic, Inc., BoxLunch, HU Merchandising, or Disney Consumer Products (“Licensor") or their respective parents, affiliates, subsidiaries, franchisees, or service agencies (collectively “Contest Entities"); (b) individuals engaged in the development, production or distribution of materials for the Contest or engaged in the administration or execution of this Contest (all such individuals and entities collectively referred to herein as the “Contest Entities"), and (c) persons who are or purport to be immediate family members (defined as biological or step-mother, father, sister, brother, daughter, son, dependent or spouse of any of the foregoing, regardless of where they reside) of any person in any of the preceding categories, regardless of where they live, or who reside in the same household (i.e., live in the same household for at least 3 of the 12 months preceding the start of the Contest Submission Period, whether related or not) as any person in any of the preceding categories. This Contest is subject to all applicable federal, state, and local laws and regulations. Void where prohibited. Licensor is not responsible for the collection, submission or processing of entries, the selection of winners, the provision or delivery of prizes, or the administration of the Contest. 3. HOW TO ENTER: During the Contest Submission Period, enter online by downloading the submission kit and digitally uploading up to ten (10) designs at http://fanartcontestdisneyvillains.fanfactoryart.com.Please click https://drive.google.com/drive/folders/1KVJ_rc5uzJx-TZtq-FL47M8UhHTdG3se?usp=sharing if you would like to download a submission kit. In order to submit, contestants must visit the submissions page during the Contest Submission Period and follow the on-screen instructions to upload their original artwork and complete an official entry form, including agreeing to the terms of the user generated content submission agreement (“Submission Agreement") and click the “Submit Your Design" button to complete the submission form. The uploaded original artwork together with the Submission Agreement and official entry form shall be collectively referred to as the “Entry." All online entries must be received no later than 11:59:59 PM PT on August 3, 2018. Attempts made by the same individual to enter by using multiple e-mail addresses/social media accounts or otherwise will be disqualified. Mass entries, or entries generated by a script, macro or use of automated devices will be disqualified. Winning designs may be used on product and featured in Hot Topic/BoxLunch stores and websites. From August 13, 2018 to August 17, 2018, a panel of qualified judges to include representatives of the Sponsor will judge all of the eligible Entries received during the Contest Submission Period and will select up to one (1) winner and four (4) runners up based on the judging criteria described below. Judging Criteria: (each criterion is followed by its weight in parentheses) submissions digitally uploaded to http://fanartcontestdisneyvillains.fanfactoryart.com must depict the character(s) from Disney Villains. Submission will be judged based on (a) Creativity (25%), (b) Originality (25%) and (c) Fits the Disney Villains theme (50%). In the event of a tie, an additional, “tie-breaking" Contest Judge will determine the winning Entry based on the criteria listed herein. The grand prize winner and finalists will be eligible to win the Prizes described below subject to verification of eligibility and compliance with these Official Rules. The Contest Judges' decisions shall be final and binding. 7. WINNER NOTIFICATION: Winners will be notified via email beginning on or about November 2, 2018 with instructions on how to be confirmed as a winner and claim their prize. Potential grand prize winner will be required to execute and return an affidavit of eligibility, a liability release, a certificate of authorship documentation assigning all rights, copyright, title and interest in the Entry to Licensor (the “COA"), a W9 form, and, where imposing such condition is legal, publicity release, within the time period specified by Sponsor. Failure to complete and return any of the aforementioned documentation within the allotted time period specified by Sponsor shall result in such Potential Grand Prize Winner's disqualification from the Contest. If a Potential Winner is found to be ineligible or not in compliance with these Official Rules, declines to accept a prize, or Sponsor is unable to contact a Potential Winner within three (3) business days, or in the event that a prize notification or prize is returned undeliverable, the prize will be forfeited and, at the Sponsor's sole discretion, prize may be awarded to an alternate Potential Winner. Potential Winners may be required to furnish proof of identification. If the Potential Grand Prize Winner's entry is accepted for use by Sponsor and Licensor, such Potential Grand Prize Winner hereby irrevocably, in perpetuity assigns any and all rights to the entry to Licensor including all copyrights. At the time Potential Grand Prize Winner is notified that their entry has been selected as the Contest's winning entry, the Potential Grand Prize Winner agrees to execute such documents as requested of them by (including, without limitation, the COA) to effect/confirm the rights assignment to Licensor. If a dispute arises regarding who submitted an entry, the entry will be deemed to be submitted by the authorized account holder of the email address provided at time of entry and must comply with these Official Rules. “Authorized account holder" is defined as the natural person who is assigned to an email address by an Internet access provider, online service provider, or other organization responsible for assigning email addresses for the domain associated with the submitted email address. As a condition of entering, entrants (or their parent or legal guardian if an eligible minor) agree: (a) to release Sponsor, Contest Entities, Administrator, Licensor, each of their affiliates, and each of their officers, directors, employees and agents, from any and all liability, loss or damage incurred with respect to participating in the Contest or the awarding, receipt, possession, and/or use or misuse of any prize or any travel related thereto. Any controversy or claim arising out of or relating to the Contest shall be settled by binding arbitration in a location determined by a single arbitrator as set forth herein (provided that such location is reasonably convenient for claimant), or at such other location as may be mutually agreed upon by the parties, in accordance with the procedural rules for commercial disputes set forth in the Commercial Arbitration Rules of the American Arbitration Association (“AAA") located at www.adr.org. The judgment upon the award rendered by the arbitrator may be entered in any court having jurisdiction thereof. The arbitrator shall be selected pursuant to the AAA Rules and Procedures. The arbitrator shall apply the laws of the State of California consistent with the Federal Arbitration Act and applicable statutes of limitations, and shall honor claims of privilege recognized at law. In the event that the claimant is able to demonstrate that the costs of arbitration will be prohibitive as compared to the costs of litigation, Sponsor will pay as much of the claimant's filing and hearing fees in connection with the arbitration as the arbitrator deems necessary to prevent the arbitration from being cost-prohibitive. If any part of this arbitration provision is deemed to be invalid, unenforceable or illegal (other than that claims will not be arbitrated on a class or representative basis), or otherwise conflicts with the rules and procedures established by AAA, then the balance of this arbitration provision shall remain in effect and shall be construed in accordance with its terms as if the invalid, unenforceable, illegal or conflicting provision were not contained herein. If, however, the portion that is deemed invalid, unenforceable or illegal is that claims will not be arbitrated on a class or representative basis, then the entirety of this arbitration provision shall be null and void, and neither claimant nor Sponsor shall be entitled to arbitrate their dispute. Upon filing a demand for arbitration, all parties to such arbitration shall have the right of discovery, which discovery shall be completed within sixty days after the demand for arbitration is made, unless further extended by mutual agreement of the parties. The prevailing party shall be entitled to an award by the arbitrator of reasonable attorneys' fees and other costs reasonably incurred in connection with the arbitration. THE ARBITRATION OF DISPUTES PURSUANT TO THIS PARAGRAPH SHALL BE IN THE ENTRANT'S INDIVIDUAL CAPACITY, AND NOT AS A PLAINTIFF OR CLASS MEMBER IN ANY PURPORTED CLASS OR REPRESENTATIVE PROCEEDING. THE ARBITRATOR MAY NOT CONSOLIDATE OR JOIN THE CLAIMS OF OTHER PERSONS OR PARTIES WHO MAY BE SIMILARLY SITUATED. DO NOT ENTER THIS CONTEST IF YOU DO NOT AGREE TO HAVE ANY CLAIM OR CONTROVERSY ARBITRATED IN ACCORDANCE WITH THESE OFFICIAL RULES. BY PARTICIPATING IN THE CONTEST, EACH ENTRANT AGREES THAT TO THE EXTENT PERMITTED BY APPLICABLE LAW: (1) ANY AND ALL DISPUTES, CLAIMS AND CAUSES OF ACTION ARISING OUT OF OR CONNECTED WITH THE PROMOTION, OR ANY PRIZE AWARDED, WILL BE RESOLVED INDIVIDUALLY THROUGH BINDING ARBITRATION AS SET FORTH ABOVE, WITHOUT RESORT TO ANY FORM OF CLASS ACTION; (2) ANY AND ALL CLAIMS, JUDGMENTS AND AWARDS, INCLUDING WITHOUT LIMITATION LEGAL CLAIMS, COSTS, INJURIES, LOSSES OR DAMAGES, DEMANDS OR ACTIONS OF ANY KIND (INCLUDING WITHOUT LIMITATION PERSONAL INJURIES, DEATH, DAMAGE TO, LOSS OR DESTRUCTION OR PROPERTY, RIGHTS OF PUBLICITY OR PRIVACY, DEFAMATION, OR PORTRAYAL IN A FALSE LIGHT) (COLLECTIVELY, “CLAIMS"), WILL BE LIMITED TO ACTUAL THIRD-PARTY, OUT-OF-POCKET COSTS INCURRED (IF ANY), BUT IN NO EVENT WILL ATTORNEYS' FEES BE AWARDED OR RECOVERABLE; (3) UNDER NO CIRCUMSTANCES WILL ANY ENTRANT BE PERMITTED TO OBTAIN ANY AWARD FOR, AND ENTRANT HEREBY KNOWINGLY AND EXPRESSLY WAIVES ALL RIGHTS TO SEEK, PUNITIVE, INCIDENTAL, CONSEQUENTIAL OR SPECIAL DAMAGES, LOST PROFITS AND/OR ANY OTHER DAMAGES, OTHER THAN ACTUAL OUT OF POCKET EXPENSES), AND/OR ANY RIGHTS TO HAVE DAMAGES MULTIPLIED OR OTHERWISE INCREASED; AND (4) ENTRANT'S REMEDIES ARE LIMITED TO A CLAIM FOR MONEY DAMAGES (IF ANY) AND ENTRANT IRREVOCABLY WAIVES ANY RIGHT TO SEEK INJUNCTIVE OR EQUITABLE RELIEF. SOME JURISDICTIONS DO NOT ALLOW THE LIMITATIONS OR EXCLUSION OF LIABILITY, SO THE ABOVE MAY NOT APPLY TO EVERY ENTRANT. 9. For the sole purpose of submitting your Entry for evaluation and potential commercial use, you are hereby granted a limited, non-exclusive, non-transferable, non-sublicenseable, revocable, royalty-free license to create a derivative work using Disney Elements as required for the purpose of creating your Entry, provided that such license shall be conditioned upon your assignment to Disney of all rights in the work you create, as set forth more fully in paragraph (iii) below. You are not granted any rights to use Disney Elements for any other purpose. “Disney Elements" are defined as elements adapted from, based on, by direct reference or by inference to (e.g., by shape or outline but without specific features), any intellectual property (e.g. copyrights, trademarks, trade dress, art works, characters, logos, brands, symbols, devices, slogans, tag lines) of Disney, its affiliates, or its/their licensors, or any variation thereof. 19. For any legally required notice of the Prize Winner, send a self-addressed postage stamped envelope to: HOT TOPIC Fan Art Contest / DISNEY VILLAINS – Winner List Request", 18305 San Jose Ave, City of Industry, CA 91748, to be received by December 31, 2018. Winner's notice will be sent after all prizes have been awarded.